This article is about the American pirate. For the Canadian politician, Charles Lionel Gibbs, see Lionel Gibbs. Charles Gibbs (November 5, 1798 – April 25, 1831) was an American pirate (real name James D. Jeffers) who was one of the last active in the Caribbean during the early-19th century and was among the last executed for piracy by the United States. His career, like many others during this time, was marked by violence and brutality. Shortly before his execution, Jeffers admitted to have been involved in the killing of as many as 400 victims. His confessions during his imprisonment and trial detailing his career were recorded and published following his death and remained popular reading throughout the mid 19th century. However, given the sensationalistic nature of these accounts, historians have questioned the accuracy of Jeffers's confessions. Born in Newport, Rhode Island on November 5, 1798, he was the son of a Newport sea captain who had served as an American privateer during the Revolutionary War. Jeffers would later claim to have enlisted in the United States Navy during the War of 1812 and to have served under James Lawrence on the USS Hornet and Chesapeake before being captured following a battle with the HMS Shannon in Boston Harbor in 1813. Later investigations into these claims proved this to be untrue. (Before his hanging, he admitted to having first gone to sea aboard a Newport-based brig called the Brutus in 1816, aged 17). On October 21, 1821, Jeffers encountered the brig USS Enterprise under Lieutenant Commander Lawrence Kearny while his fleet of four ships were attacking three merchantmen off Cape Antonio, Cuba. Despite outnumbering the USS Enterprise, Jeffers's fleet was destroyed after a short battle and he was forced to flee into the jungle with his men. Little is known about his life immediately following his escape. He claimed to have resided in the United States by 1825, and to have served Argentina in the Cisplatine War as both a regular naval officer and as commander of a privateer. Following a reputed voyage to North Africa to join the Barbary Corsairs, Jeffers was eventually forced to find work as a sailor again. 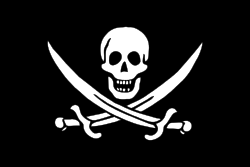 After signing with the brig Vineyard (using the Charles Gibbs alias), he and Thomas J. Wansley (and several others) led a mutiny, killing the captain and his first mate on the night of November 23, 1830 in an attempt to seize its cargo of silver. The mutineers headed for Long Island where they scuttled the vessel and came ashore, several mutineers losing their lives in rough waters which also claimed much of their loot. After only a few days ashore Jeffers, Wansley, and two others were captured and taken to prison in New York City (other accounts incorrectly claim he was executed in New Orleans) where he and Wansley were tried and convicted of mutiny and murder in 1831. Incarcerated at Bridewell Prison and then moved to Bellevue Prison, they were eventually hanged at Ellis Island on April 22, 1831. Gibbs' skull is on display in the museum of the General Society of Mechanics and Tradesmen. Gibbs, Joseph (2007), "Dead Men Tell No Tales: The Lives and Legends of the Pirate Charles Gibbs." University of South Carolina Press. Ellms, Charles. The Pirates Own Book: Authentic Narratives of the Most Celebrated Sea Robbers. Salem, Massachusetts: Marine Research Society, 1924. Gosse, Philip. The History of Piracy. New York: Tudor Publishing, 1934. Lindsay, Philip. A Mirror for Ruffians. Ayer Publishing, 1939. ↑ Confession of Charles Gibbs, the pirate, who was executed on the 22nd of April, 1831. New York: C. Brown, 1831. ↑ Gibbs, Joseph. "Dead Men Tell no Tales: The Lives and Legends of the Pirate Charles Gibbs" (pdf). Retrieved 2007-04-05. ↑ Gibbs, Charles. "Death Notices, Western Weekly Review, 1831". Archived from the original on 2007-09-29. Retrieved 2007-04-05.